You are a buyer for a merchant house in the competitive, but profitable age of the infamous Medici family. 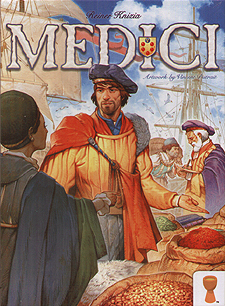 Medici is an auction game for 2-6 players. Over three rounds, players will buy and load goods onto their ships before receiving money for the value of their holds. But be careful, the money you use to bid at auctions is also your end game points!